The day started much like most Saturday’s – with a morning run! I knew we were going to get a decent amount of rain…and I didn’t care to get wet. So I woke up around my usual “long run” time and got out of the house quickly. The route I took allowed me to run around 6 miles before the rain was supposed to start… Phew! My pace was def faster than a “long run” pace, so I finished with a little time to spare. While stretching and playing with the pup outside, it started to barely sprinkle…back inside! I then started up the dryer, made myself a post run protein drink, and settled into the couch. I usually take a little more time getting ready for my long run, so I ended up having a few hours before human life started rustling upstairs. I checked out some social media and soon passed out hard! I woke up closer to 8am with a lot on my plate for the day – let’s see if it all gets done! Oh well, weekend plans happen – and then they don’t. Little man slept in until 8:30am and then the day really started! FINALLY, potty #1 for the weekend! It was just a dribble, but a start! The one event I didn’t cancel was my Bountiful Basket pick up! Since being out of town last weekend and eating us out of everything before leaving town, we were scarce of fruits and vegetables… I filled out a contribution form early in the week…before I REALLY thought about the timing of the pick up. We did really well at the pick up, no accidents! When we got home, I asked him if he needed to go potty and he said no…so I set the timer for 5 minutes. What does he do? He goes potty in his pants 2 minutes later… Well, I guess it is more of a “We will sit on the potty when mommy says” and not “do you think you need to potty” situation for a while… Within the next 15 minutes, he then wet his pants 2 more times…oh boy! We are not batting well today but it is a start! The rest of the day was a whirlwind of accidents, changing pants/undies, and trying to prep and clean for the week ahead. By the early afternoon, I was a little worn out, but my run WAS GOING to happen! The little guy didn’t REALLY want to go down for his nap, so I had to sit with him for a while before I could go. The hubs was home and starting his own fun of smoking a pork loin for dinner. I was able to get out for my last and longest long run of marathon training – the 20 miler! The first few miles felt good, but I could tell that it was going to be a hard one today. There were some crazy winds and the sun was warm, but not quite warm enough for me to want to take my long sleeve off… At around mile 6, I started thinking about not running the entire distance…sad, I know. My foot had started hurting a little (manageable aches and pains) and it was getting into my head. My Nuun water filled hydration pack was now warm (it did start with lots of ice) and drinking it was no longer refreshing… So I veered off course at around mile 8.5-9 to stop at a gas station for some ice. I have stopped here several times in the past for a pit stop, and this is now the second time I have stopped to ask for a cup of ice. With an empty bladder and a full hydration pack, I was off again. Around mile 11 or so, I noticed a couple side-roads that I have never ventured down before…so I ventured. I was able to add 3 more miles just going up and down the side roads that I have always known to be there (I pass them every time I run this route)! At this point, mile 14, I am 2 miles from home…I thought quickly about just heading home with 16 miles – but I also knew that if I kept going straight, I would run 2 miles down, 2 miles back, and THEN the 2 miles home…which I then set out to do!! At mile 18, I felt such an overwhelming senses of accomplishment!! Once my watch beeped for mile 20, I walked the remainder of the way home. Wow!! I even had negative splits the last 3 miles! Once home, I had a cold bath waiting for me and dinner wasn’t too far behind that. The rest of the evening (and weekend) was spent relaxing and reveling in the greatness of the weekend. Also, before putting little man to bed, we had a breakthrough! He sat on the potty and watched himself go pee…while this is nothing life changing, he then understood what I was wanting him to do on the potty seat! He peed, stopped, peed some more, stopped, etc… Every time he would pee, I would get excited for him and he was loving it! Let’s hope that this is the start of an easier time potty training! The day started with a little Coffee Date (virtually) and breakfast for the little guy and I. 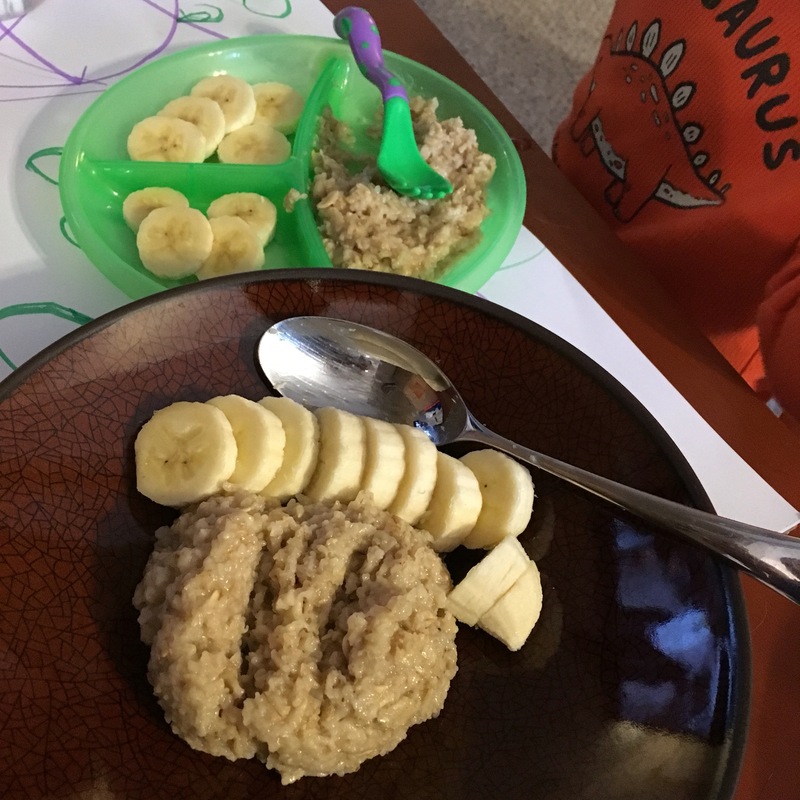 Every weekend, my heart is warm with happiness when I get to sit down with little man and eat breakfast : ) I’m not sure what it is, but it just brings me the greatest joy! The menu was oatmeal, oranges, coffee (for mom) and milk (for little man). 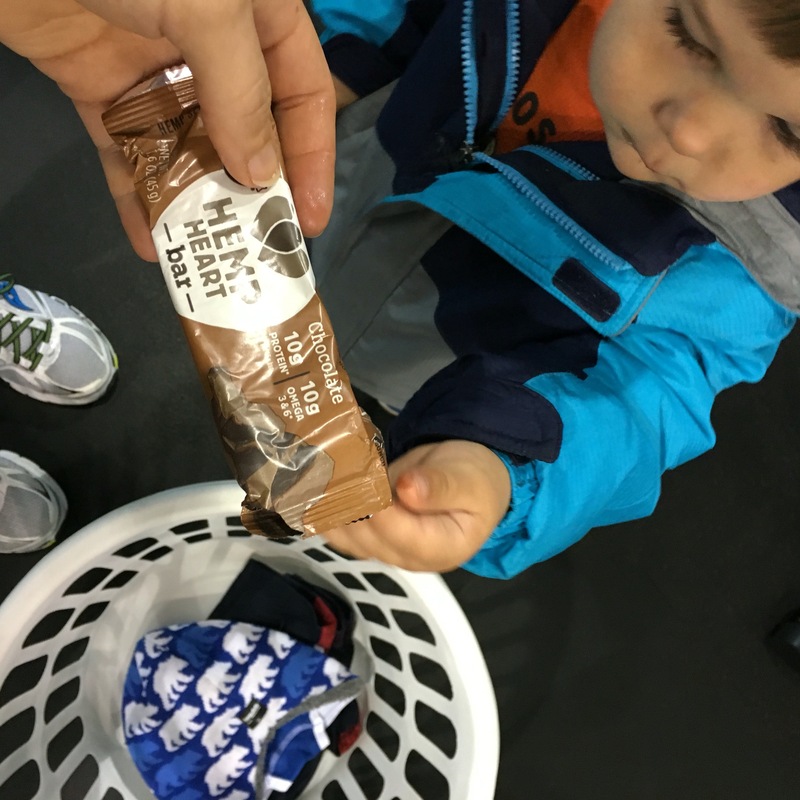 While little man’s oatmeal was a little more on the slightly sweetened side, mine had PBFit, dark chocolate chips, cinnamon, stevia, and a mint chocolate covered espresso bean : ) Talk about special treatment! The remainder of the morning consisted of playing with the dogs toys, going for a motorcycle ride through the living room (getting mad at running over toys rather than moving them first…), rolling around with the dog, coloring, and watching movies. So, this weekend is going well! We go to the potty, no questions asked, at least once an hour…and we had no REAL accidents…at home. When we went to the Bountiful Basket pick up, we were in line for a LONG time and I noticed a small wet spot on his pants when we got back to the car…not a full bladder accident, but a small one while waiting forrrrreverrrrrrr… I count that as a successful day!! Once we got home, we ate some lunch and then settled in for a nap. Little man was tired, but DID NOT want to lay in his bed…but he would settle down if I held him. So that’s what we did…I played on my phone for a bit, but I too eventually settled into a little nap session. 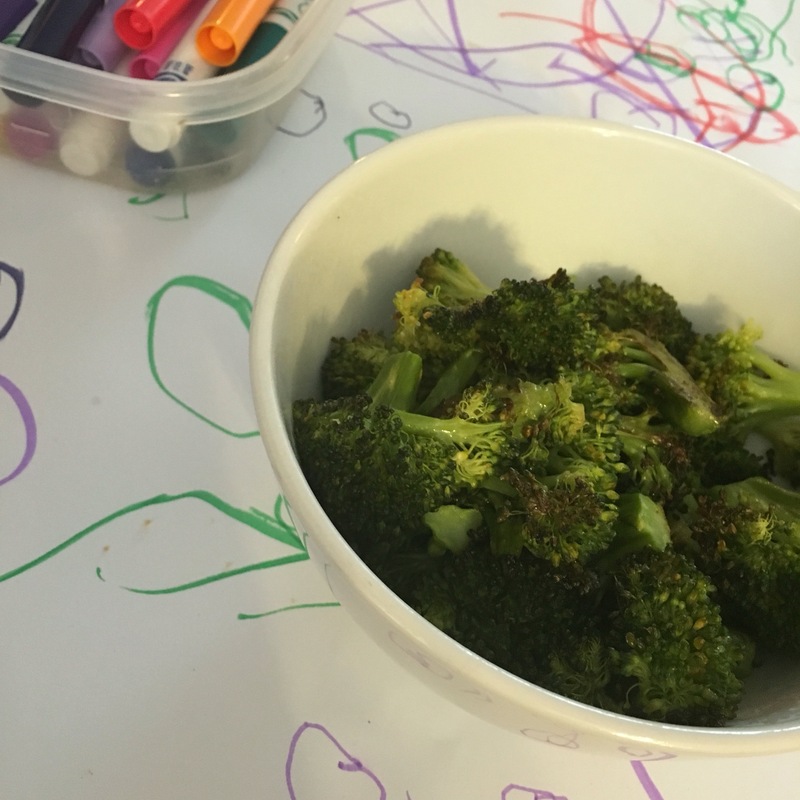 After nap time, little man settled into playing again and I started working on some meal prep for the week with my new batch of Bountiful Basket items. After a while, daddy came home from work, but was then out burning fields with his cousins the rest of the evening. Little man and I went for a run walk to wind down the day. All plans start with good intentions…like going for a run before the sun comes up, for example. Good plan!..but only if it happens! gotten in gear and just WENT for my run…then I wouldn’t have to worry about planning the time to go run the rest of the day. With the Season Opening Game Day for Royals baseball on the schedule, the hubs plans on going out to watch the game with the guys – that is the only MAJOR hurdle when planning my run today. Well, the little man was having a rough morning…and so we tried to go down for a nap around 11:30am…but he kept saying “potty” before we would lay down…so he procrastinated for 20 more minutes. We pottied, we brushed our teeth, we washed our hands, we put lotion on, we went potty again…and finally, he settled on my lap for a few minutes. Once I thought I was in the clear, I put him in bed…which he promptly sat up and stared at me. Well, that didn’t go as I wanted… I talked him into laying down and I rubbed his back for a bit, said my nap time love yous, and left the room. Now that the little guy is down, I can go for my run! Sike… The hubs wants to go to the store for a few things…and no, he would rather not wait until after I get back. Okay…so I will do some more meal prepping and cleaning tasks. 2pm, this is going to be a hot run…80+ degrees, high winds, not too bad. I did call upon my BIL for a pit stop and ice/water refresher for my hydration pack (thanks Jake!) because I was not smart about heading out in the heat of the day with a partially full pack. Oh well, good thing he was home, or my run would have been cut shorter than I would have liked… Or more than it was anyway…my Garmin died around mile 7. That just put me in a funk and I didn’t REALLY want to run more than I knew the distances of… So, I headed home with 3 to 3.5 miles to go (depending on the route I took). I took the shorter route because my heart just didn’t want to go the extra full mile. Oh well, a good run overall, even with the hiccups! I came home to a little boy in new clothes…yep, he pooped his pants for daddy for the 2nd time… Hopefully he learns how to control his no2 before too long, there is only so much poo we would all like to be dealing with on a daily basis. There is the great Weekly Wrap #linkup with Holly and Tricia! Also, check out a couple other weekend updates with Meghan and Katie! Ah potty training… I hardly remember it with my first, but we’re getting ready to start with my daughter. She doesn’t seem to keen on the idea, so we might end up delaying it a bit. I never thought I’d want to put it off, but diapers are so much easier. Ha ha. 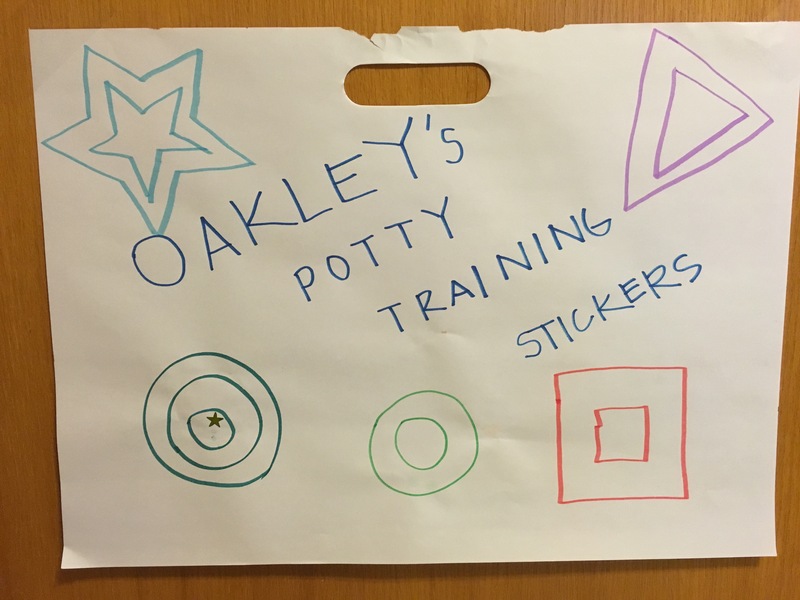 Sounds like you guys are doing AWESOME with the potty training – go you, momma! I’m totally terrified of potty training. I currently have 2 under 2, so it’s barely on my radar, but I know the time is coming! You are doing great! Little O is going to be not-so-little before long…enjoy it!! I love Bountiful Baskets, we live in Nebraska where are you at? Potty training is such a chore I have heard, we don’t have kids just yet but I am wondering what that will be like already. Oh my you do have your hands full. It has been so long ago but I don’t remember my daughter having any problems with it. Course we are talking 20 years ago. Good luck to you in trying to figure out the balance. It sounds like your doing a great job! Balance is key 🙂 He doesn’t always want to go…but I am a good briber! Good old potty training. It seems to take forever, but it’s really just a blink of an eye. My husband’s aunt would always say “they won’t go off to college pooping in their pants”. LOL. Great job on that 20 miler! Do you always run solo like me? It’s very nice the gas station will give you ice! Thanks for linking with us Lindsey.